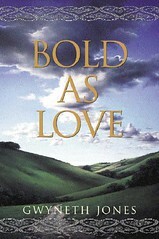 It is Bold as Love’s central strangeness: that it asks us to believe rock stars could really be revolutionaries. It’s not, I think, the exchange of celebrity for political power that’s problematic – not in a post-Governator era, at least; not until after the initial off-screen hand-wave that brings the musicians into politics in the first place, anyway – but the idea that such individuals might make the transition yet retain principles. Even Ax is forced to comment on the implausibility of that. It’s a potent notion, this belief in the power of music, with enough juice to often obscure the fact that Jones is at her weakest when writing about it, when creating a musical world. She displays an absolute tin ear for band names and song titles, her made-up music journalism is cringeworthy, and there is little sense of the wonder and transformative power of music itself. What she can convey is the ambience of musical events: her gigs are all jagged energy and aftermath, her festivals true worlds unto themselves, right from the start, when Fiorinda stands outside Reading seeking “the mere will to cross that boundary and join that fair field full of folk” (2). To enter faerie, with its customs and denizens and magical ways. Had the country been about the split in two, collapse into civil war, until the situation was saved by rock and roll? This morning the idea seemed absurd. We will never know, he thought. Maybe we made a difference, maybe we didn’t. This, I think, is the closest to a definitive understanding of the role of music that the novel offers, a viewpoint that downplays the importance of music as music. Rather, what’s significant is the potential of music to be a vehicle for belief, at a moment when belief in all other systems of the world has been shattered by catastrophic cynicism. workers – bankers – rockstars would be the trajectory today. We are all bankers at the moment: Lloyds etc. I think that is perhaps easier to understand than us all being venture capitalists at turn of millennium but I’m sure that is what Jones meant: PFI etc.. How do you change that succession? Rockstars are a possibility – the logic is that we would all be rockstars because that is the way England would be symbolically figured (rather as we were all *workers* during the heydey of the postwar welfare state). Maybe it can be read that way rather than as sequence of successively smaller groups. In many ways it would be nice if rock stars did take over the country. However, I’ve been working in an Oxfam bookshop for the last couple of years, in charge of sorting vinyl records and old CDs. I find that if we rely on the taste of the great British public it won’t be classy rock musicians that take over. Almost every donation contains stuff by John Denver, Barbra Streisand, the Carpenters, Neil Diamond or the New Seekers. If we had an English Rock dictator, prepare yourself for rule by Elton John. Then I started thinking about possible good canditates for the job. Clapton or Mark Knopfler would be too boring. I would love to see stroppy Jack Bruce in power, but he is Scottish. Can’t see the Gallagher brothers not starting a civil war. And please not Geldorf. The election is now open. Ryder for president.